The OCMT technology partner, Vretta, and the lead institution for the implementation of the OCMT, Humber College, have received a gold award from the prestigious Brandon Hall Group in the category “Best Advance in Custom Content” for the OCMT project: Addressing the Numeracy Gap through Immersive Technology Solutions. 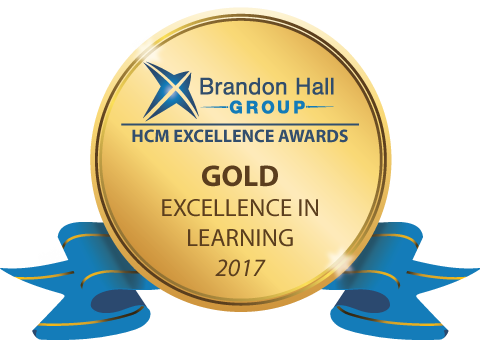 The Brandon Hall Group Excellence Awards Program is the most prestigious awards program in the learning industry around the world. Often times called the “Academy Awards” in the learning industry, this Excellence Award recognizes the best organizations that have successfully deployed programs, strategies, modalities, processes, systems, and tools that have achieved measurable results. “Last year, Vretta won its first Brandon Hall Group Excellence award for increasing student success using blended learning programmes. This year, we are honoured to receive this coveted recognition, along with Humber College! This award recognizes the work that we have done in collaboration with the 24 colleges in Ontario, supported by the Ministry of Education and the Ministry of Advanced Education and Skills Development. It features the Assessment for Learning program, OCMT, addressing the numeracy gap by pushing the boundaries of interactive technologies to make the experience of learning mathematics engaging and enjoyable for students.” said Anand Karat, President of Vretta. “Humber College is very proud to partner with Vretta on this critical project and also extremely proud of the work that we have done together to support student achievement in mathematics. Receiving a Brandon Hall Group Excellence Award not only speaks to the innovativeness of the tools that we have developed as partners and as a community of educators dedicated to making learning mathematics meaningful and enjoyable, but it also speaks to the importance of addressing this issue. “said Paula Gouveia, Dean, School of Liberal Arts and Sciences at Humber College. The Brandon Hall Group’s HCM Excellence Conference will feature this year’s award winners in Florida on January 31st, 2018. We look forward to attending this amazing conference, meeting peer world-class organizations and listening to real-life success stories that have resulted in measurable results.